Wood ‘N Tole features the eye-catching collection of woodwork designed and created by Jim McGuire that can be great home decors or mementos for you. Putting his interest and passion together, he can carve anything on a piece of wood transforming it to an artwork. His great wood crafts are awarded and appreciated at various art exhibitions in and around Santa Clarita Valley. Whether it is a celebrity portrait, a nature scene, a welcome sign or jewelry, Jim can carve literally anything in his Canyon Country garage. He started his carving with a saw that he bought from a fair, and has continuously been improving and innovating his skills. He has produced his most intricate design, “Big Cats,” that took almost 1,000 cuts to create. From natural wood to eucalyptus to some of the most efficient plywoods, he is proficient in working with any types of wood providing the quality of piece you need. Jim’s woodworking skills are unmatchable. He enjoys creating unique designs that can satisfy the vision of every customer. With the use of only a scroll saw, he can make more complex carvings that shows in every piece of his artwork. In his famous piece “First Fathers,” you can see some of the stunning details of his work that features the faces of Mount Rushmore towering above Indian Chiefs. 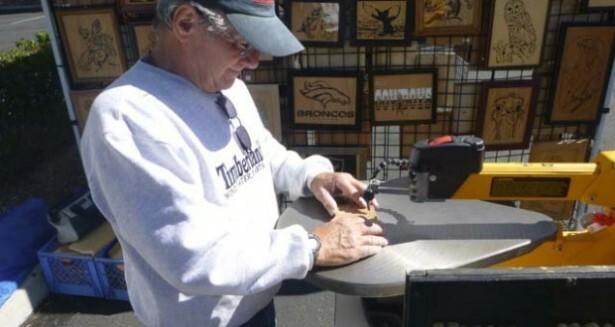 Jim and his wife Arlene take Wood ‘N Tole and their lovingly creations to several craft fair and art shows in Southern California throughout the year. Jim’s handcrafted woodwork has won awards from the Orange County Craft Fair, and were featured in The Santa Clarita Valley Signal. His affinity towards the wooden crafts and immense carving skills enable him to create pieces that can attract and impress people of all ages. With his imagination, there is no limit to what Jim can create and you will be surely amazed to know that, without any prior training in woodworking, how beautifully he renders his imagination on a piece of wood. His handcrafted pieces can be a wonderful collection that can enhance the beauty of your Santa Clarita home in a very unique way.